Last week we realized we needed a final spring dose of nomadacy. We decided on a nearby destination of Mingus Mountain. Though we had driven over Mingus Mountain many times it's an area we hadn't really explored before. We planned for 2 maybe 3 nights. Midday on Tuesday we drove to the top of Mingus Mountain and turned off the pavement. After a little exploring we found a suitable boondocking spot to make camp. It was nice and at around 7,500 feet elevation definitely cooler than home in Chino Valley. We woke up Wednesday still a little restless and after breakfast decided to break camp and drive down the mountain to Jerome. We enjoy Jerome and daytrip there several times a year. We checked out a couple of shops and had an outstanding lunch at Grapes, a favorite restaurant. From Jerome we headed north on Perkinsville road. We have travelled Perkinsville road from the north to Chino Valley but never starting from Jerome. It's marked as a "primitive road" and that it is, being rough and often one lane with sharp, blind curves and unprotected dropoffs. I remarked to Joni "You look at the scenery for us Doll and I'll drive". As we dropped in elevation down into Verde Valley the temperature rose until we saw a high of 103 degrees. We definitely weren't camping anywhere in Verde Valley, though we did save the GPS coordinates for a beautiful spot to come back to in cooler weather. Fortunately we had already set our sights on somewhere in the Kaibab National Forest south of Williams, AZ (another destination we daytrip to, usually in the off-season). We reached the junction with Coconino County Road 73 and turned north. We kept a close eye on the temperature as the road went up and as soon as it dropped below 90 degrees started looking for a forest road to turn off on. It didn't take long to find a promising one. We were happy to turn off on the dirt and start looking for a camp site. Shortly we found one on the edge of a small meadow; it was definitely an "Oh My Goodness" spot. 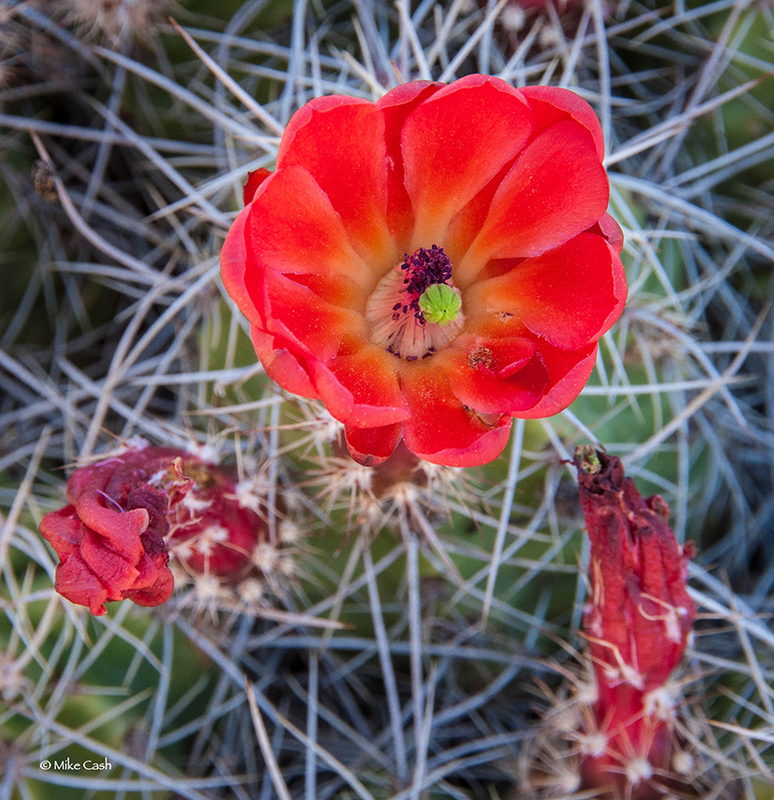 After making camp we explored the area finding lots of wildflowers and claretcup cactus in bloom. Beside a large cairn was a benchmark and upon reading it we discovered we were camped on the Historic Overland Road Trail (definitely something to research for upcoming adventures). After our explorations we returned to camp for a great dinner and a lovely evening of watching the sun set before retiring early. What with our somewhat remote campsite at 6,849 feet elevation it was both quiet and cool allowing us to sleep deeply through the night. Thursday morning after breakfast we enjoyed coffee "on the veranda" (outside under the awning) as we gazed across the meadow watching and listening to the birds. Then we set out on foot down the Overland Road with the goals of exercise, enjoying the beautiful forest and, for me, making photographs of wildflowers. We had a great time, returning to camp just as the midday heat was coming on. After lunch Joni and I looked at each other and we both knew it was time to head home. Please enjoy a photographic review of our trip below. Also don't miss the wildflower photos on our images page. I was wandering around our campsite at dusk and saw a wildflower I hadn't seen earlier. Desert Evening Primroses were everywhere. The next morning they were gone as is their way. Joni's photo of the warnings. Don't worry, I was driving while Joni captured the view. It seemed an appropriate song at 99 degrees on the way to 103 as we drove down into the Verde Valley. We stopped at this almost dry creek. The remaining pools were teaming with life, tadpoles, butterflies and assorted insects. At 103 degrees we didn't stay long! Joni looks back to the Verde Valley and the mountains beyond. Joni finds a "horse head". Ah, dinner! Simple and tasty! Please enjoy the photos below. Click on one for a larger view. Then you can scroll through them and roll over an image for a description.